Showit allows you to create a completely custom theme that you can publish to WordPress. The following outlines a few of the steps and options for this process. This article will use some more advanced WordPress terms so that if there are questions you can learn more through the wealth of articles on the Internet related to WordPress. In Showit, click on the “Site” tab to see the list of blog templates in the second section. Each design that comes with Showit comes with a blog theme and the most basic requirements for a blog theme are a layout for the Post List ("Blog" page) and a layout for a Single Post. When you click on a blog template, you can click on the “Template Info” in the properties on the right. The “WordPress Template” drop down allows you to choose one of the standard WordPress layouts that you want this page to be used for. The basic options are in the drop down along with the option for a custom template which can use the WordPress Template Hierarchy. The blog page can now be designed as a normal Showit page with placeholder content. Select a text field and there is an option only in the blog templates in the “Text Field” section to be able to set a text box to be replaced by WordPress content from a post or page. 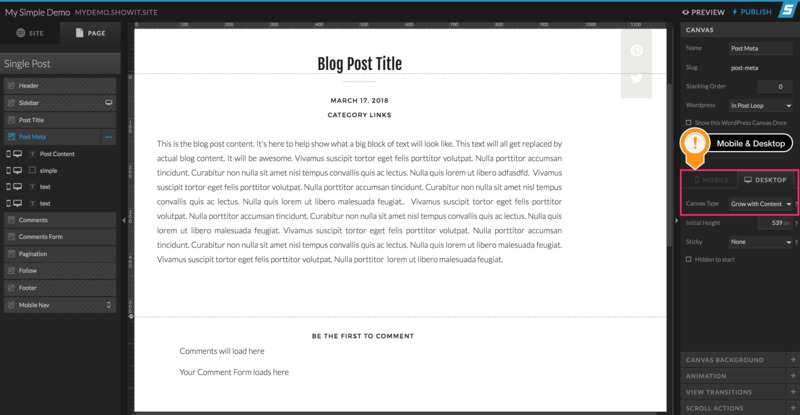 Once the site is published and connected to a WordPress blog, the content in the blog will replace the text fields in the template. Text Box – Auto Overflow using "Grow with Content"
Showit uses a fixed layout so that what you design shows up exactly where you design it. However, for blog content that could get bigger than the size of the box on the Showit stage, the template needs to handle the ability to get bigger. This is done by placing each text element that could grow into a new canvas and setting the canvas to “Grow with Content”. With this option set, Showit then measures the height of the content of the canvas and expands the height based on how much the content is bigger than the placeholder. 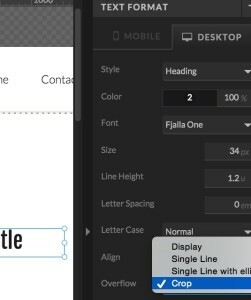 If you prefer not to have the text content grow, you can also choose an “Overflow” for the text layer to be either “Crop” or a “Single Line” option. If your text has paragraph breaks, it won’t force the text into a single line but it will crop at the end of a single line. You can also place an image, then check the box for “WordPress Featured Image” and the featured image will be replaced into the page.